My friends agreed in the next few weeks as we caught the show. The "New Jan" was a hit and strange enough a reason for watching an otherwise boring show. Anyway, sometime early in 2001 while surfing through the Sid and Marty Krofft sites I came across the Brady hour page and the complete story of Geri Reischl and her "Fake Jan" status. And it mentioned she would autograph a picture and send it just for the asking. I wrote an email asking if she was really her and would she really send me an autograph. Well quite a while went by when I got a reply saying yes it was really her and yes she would send me an autograph. The photo albums on her site had just gone up and I was looking over the old publicity photos. I had not see that side of the "New Jan" back then. I could see myself as an obsessed teen fan if I had :) Sigh. 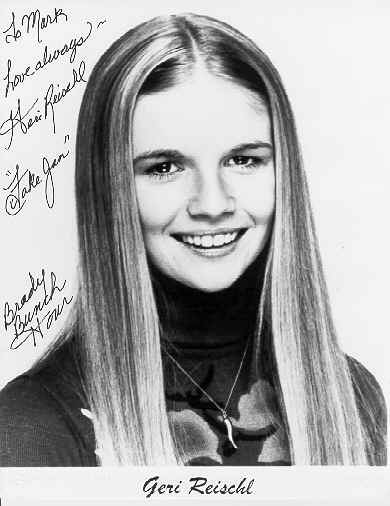 So I opted for the "Jan Brady" photo. Because that is the way I remember her. Months went by and I had forgotten about it. Then in the beginning of December I got an email from Geri saying sorry for the delay my autograph was in the mail. Wow. So I sent a reply back saying "Thanks you big "fake" you :)"
Only on the internet.. Wow. Take a look at this. Thanks for the autograph Geri. If you would like to see her story and maybe get an autograph for yourself then go visit the Official Geri Reischl Page.